It's grey week! Let's take a look at Rohrer and Klingner Sketch Thea. The Sketch line of inks is pigmented, and designed to be water resistant. I purchased my sample of ink from Vanness Pens. Thea is a medium grey with a slightly chalky appearance when dry. In large swabs the ink does show different shades of black, but no sheen. Dry time: 15 seconds. You can find other fast drying inks here. On Staples 24 lb copy paper there was some feathering in most nib sizes and just a little bit of bleeding. This ink does tend to spread more than other inks do. In a fine nib it looks and feels more like a medium nib, and in a medium nib it behaves more like a broad nib. Since it is pigmented, you need to shake it before using it, which does make the ink a bit frothy. R&K also recommends not leaving this ink in fountain pens for long periods of time. Ink swabs for comparison, left to right (top to bottom for mobile RSS): Diamine Earl Grey, Diamine Grey, and Monteverde Smoke Noir. 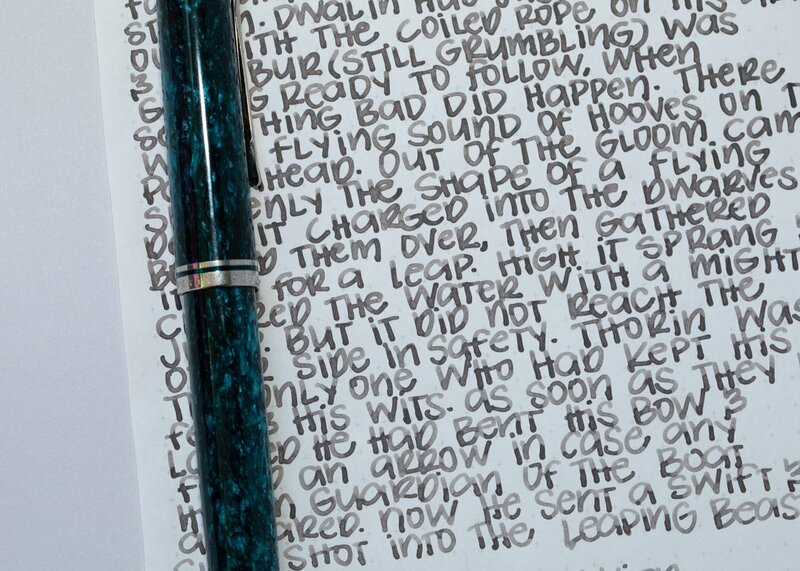 Click here to see the Rohrer and Klingner inks together, and here to see the grey inks together. Overall, I like that this ink is fast drying, water resistant, and has a lovely wet flow. I also like the color. I wouldn't leave this ink in a pen longer than a few weeks, because of its pigment. I would treat it like a shimmer ink and be careful to clean it well.